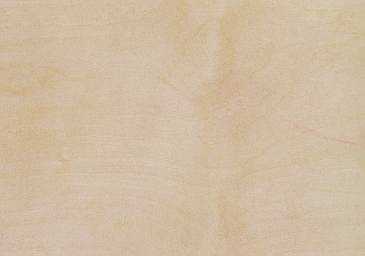 Choice of Spruce top wood: Sitka, Red, White, or German. Also Port Orford Cedar and Redwood. Choice of wood for the backs and sides: East Indian Rosewood, Honduras Mahogany, Koa, Black Walnut, Imbuya (Brazilian Walnut), Western Maple, Pacific Dogwood, Purpleheart, Padauk, American Black Cherry, Lacewood, Western Paper Birch etc. What's in stock will vary. 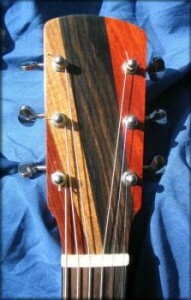 Choice of fretwire, standard or wide/high. Choice of wood binding (curly Maple, Ebony, Purpleheart, Koa, Bloodwood, Tigerwood, Myrtlewood, Teak, and many more), decorative purfling, and rosette. Fingerboard width, curve and string spacing at the saddle tailored to your requirements. Acoustic tone and responsiveness tailored to your style of playing. Left handed guitars are available in all models at no extra cost. Venetian Cutaway (rounded) on all models except the Parlor and RRL. $800. K&K Pure Mini pickup Internal acoustic amplification with excellent balanced sound, no effect on non-amplified sound, and no internal preamp/battery required. $240. Graph-Tech RATIO open-back tuners. 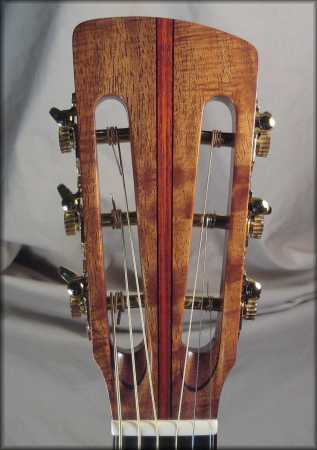 The quality of Waverlys with individual gearing for each string. $100.